There’s a rather prominent chain of Italian casual dining restaurants that is famous for a number of imaginative and delicious pasta dishes. My girlfriend TJ and I go there occasionally when we need a quick pasta fix. Somehow, we would find ourselves satisfied enough with the place. Unfortunately though, the place has a tendency — a habit — to scrimp on their ingredients, which lessens the taste of their pasta. Strangely also, thinking about this place reminded me of a blog post and recipe I did almost five years ago. So I checked that post. And upon reading it, true enough, the places then and now are actually just one and the same. Proof that some things never change? The way I would react to such a scenario hasn’t changed either. As in five years ago, my reaction was to try and cook something myself at home. It has been a while since I last cooked, and I am very thankful that I finally found the time to do so today. Ironically, I woke up to a headache this morning, which almost disrupted what should be a good weekend. So to get my mind off my headache, I cooked. In hindsight, I realize that cooking is a better pain reliever! Noodles: I used capellini noodles, which is almost like angel hair but slightly thicker. The truth though is, you would see very little difference between the two. (Well, they are, after all just a few millimeters apart in terms of size). The secret of any good pasta, I believe, is for the noodles to have good flavor on its own without separating itself from the sauce. What I mean is that while the pasta should be well-seasoned during the cooking, the overall flavor must be in synergy with the sauce to form an outstanding dish. To achieve this today, what I did was to put 3 bags of green tea into the part from the very beginning. Upon boiling point, seasoned the water with salt, then added the noodles. I used a one-burner induction stove today, so after the noodles were almost al dente, I turned off the heat, strained the water, and set the pasta aside so I can make the sauce. I used about 250 grams of pasta, by the way. Sauce: The sauce has to be as simple as possible so that the unique ingredients can be appreciated. In low-medium heat, I melted half a bar of butter and in it, I sautéed three cloves of chopped garlic. Add the noodles, after which, I added some red basil pesto. Some background: I was intrigued when I saw these at the grocery, as I’ve never cooked with red basil. They are of red-purple color. A quick internet search revealed that they are very much related to sweet basil but have stronger flavor. 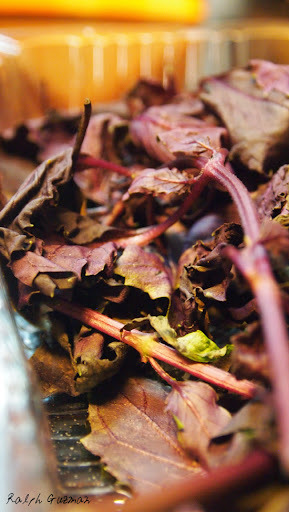 To make red basil pesto, I simply got a bunch of basil leaves and put them in the food processor. Add 3 cloves of garlic, some olive oil, pepper, and some parmesan cheese. Then set them aside until you are ready to add them in. So after adding the red basil pesto into the noodles, add about 3 tbsp. of chopped flat leaf parsley. It’s wonderful how the parsley adds a refreshing, almost minty tone to the strong notes of the pesto. You can add a little more parmesan cheese, after which, I top the dish with some smoked salmon. And as a final ingredient, I added shrimp roe. Yes, they are popularly used for sushi. 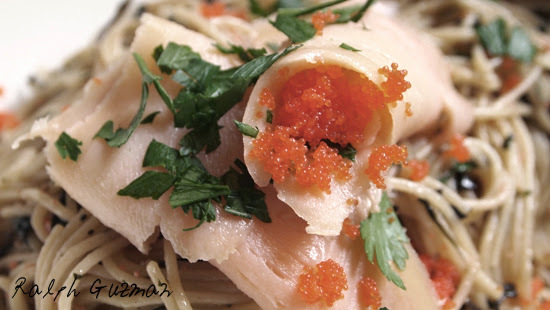 But — roe is also used in many other Japanese and even Russian dishes. And perhaps, even Italian dishes. The pasta dish I ate last night at that Italian restaurant had a different kind of roe in it, and it worked very well. I love how the roe adds dashes of color to the dish. They are like confetti, don’t you think? Hence, I decided to add “shrimp roe confetti” to the title of this dish. Of course, they do add interesting flavor too. There’s a saltiness to it, but it’s not as salty as, let us say, many kinds of caviar. The taste? The noodles are well seasoned. Contrary to what I had thought, the noodles don’t taste like green tea at all. But there’s a certain kick and saltiness to it that contributes to the overall dish. I loved the taste of the pesto and how it contrasted with the parsley. 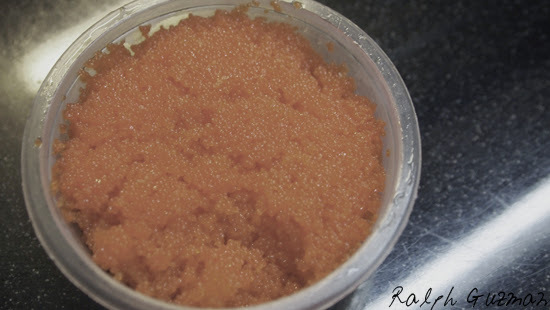 And the texture of the roe was just lovely. The salmon did add flavor. But the truth is, you can have the dish sans the smoked salmon. So if you don’t have smoked salmon at home at the time you decide to make this, don’t fret. 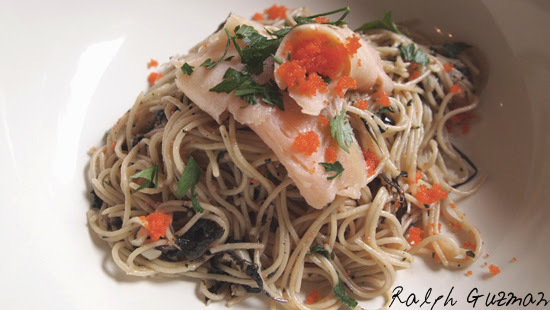 This entry was posted in Food + Recipes, Pasta + Noodles and tagged Capellini with Red Basil Pesto and Shrimp Roe Confetti, Fusion Pasta, pasta recipes, ralph guzman, Ralph Guzman Pasta Recipe, Red Basil, Salmon, Salmon Shrimp roe, Shrimp Roe, smoked salmon by Ralph. Bookmark the permalink.